Have you ever wanted to play on old German street game requiring only a whittled broom stick and eat a bologna sandwich while nuns watch enthusiastically with the sounds of a rag time band playing in the background? Look no further than Schnitzelburg. 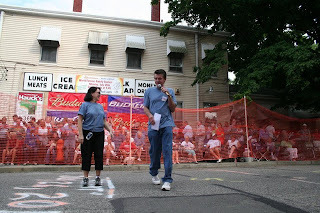 On the last Monday on July, a block of Hoertz Street, otherwise known as George Hauck Way, closes down for the annual World Championship Dainty Contest. Revived in 1971 by George Hauck and Charlie Vettiner, the Dainty Contest celebrates its 43rd year this July. 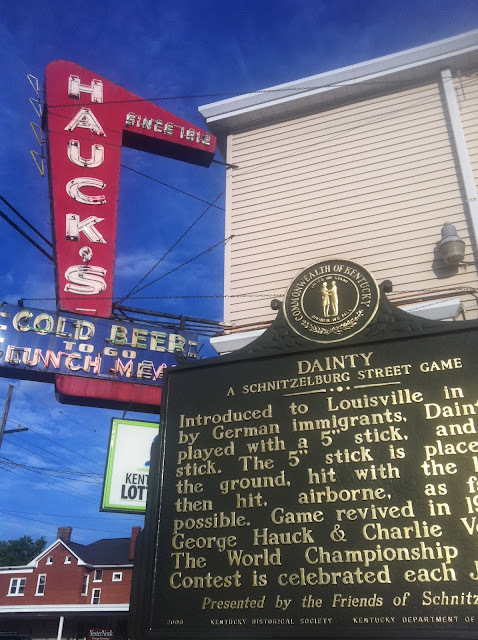 The games are played next to Hauck’s Handy Store, a staple in the Schnitzelburg neighborhood since 1912. 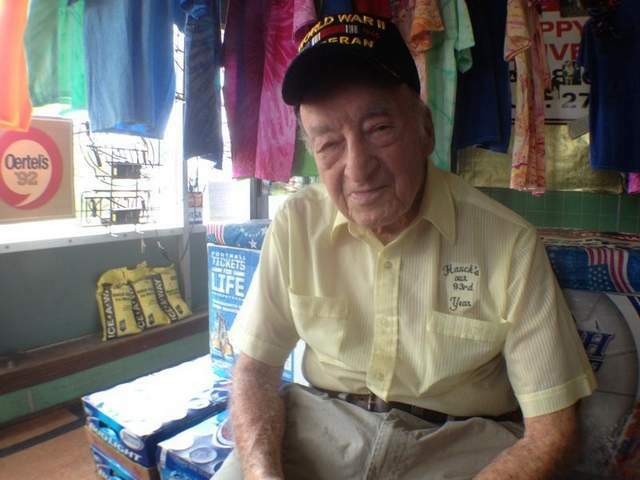 The namesake of the store, George Hauck, will be 93 years old at this year’s Dainty Contest. Dainty is a game that originated by German immigrants in 1800. The game requires a 5” stick and a 3’ stick, which can be cheaply made from an old broom stick with the bristles removed. 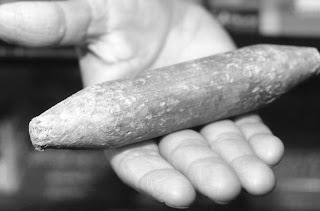 The 5” stick, known as the dainty, is placed on the ground (usually with cone shaped ends) and the 3’ stick is used to hit the dainty. The object is to get tap the dainty, making it airborne, hit it like a baseball, and try to get the dainty the furthest, all with one hand behind your back. Contestants get three strikes (one strike = any contact between both sticks) and then they’re out. Though it may sound simple, it isn’t. Most people don’t even get the dainty more than a couple of feet, let alone a few inches. However, the record was broken last year by Herb Rowe with a whopping 149 feet and seven inches, beating the previous record that was set in 1981! The winner gets a trophy and bragging rights, while the person who hit the dainty the shortest goes home with a basket of lemons. Oh, there is a strange catch – you must be 45 or older to play. But the event isn’t just for adults over 45. Hoertz and Goss will be littered with a mix of people on the upcoming July evening, from little tikes enjoying cotton candy to hipsters having some cool brews to grown-ups playing the lotto out of brightly lit Kentucky Lottery mobiles. After the initial contest there will be a one-legged race for the kids and a band, so you might want to bring your dancing shoes. You can pick up a Dainty meal – a bologna sandwich, a bag of chips and a whole dill pickle - for the unbelievably low price of $2.00! Add to this a copious amount of beer and ice cold soft drinks and it’s a party! The 43rd World Championship Dainty Contest will be played on Monday, July 29th beginning at 5:45. There will be door prizes and a 32” flat screen television giveaway at the end of the night. Proceeds from the Dainty Contest benefit The Little Sisters of the Poor. Oops, typo! That should be gmail.com, not con. It suspect it's autocorrect doing it again. I’ve been searching for some decent stuff on the and haven't had any luck up until this point, You just got a new biggest fan!..